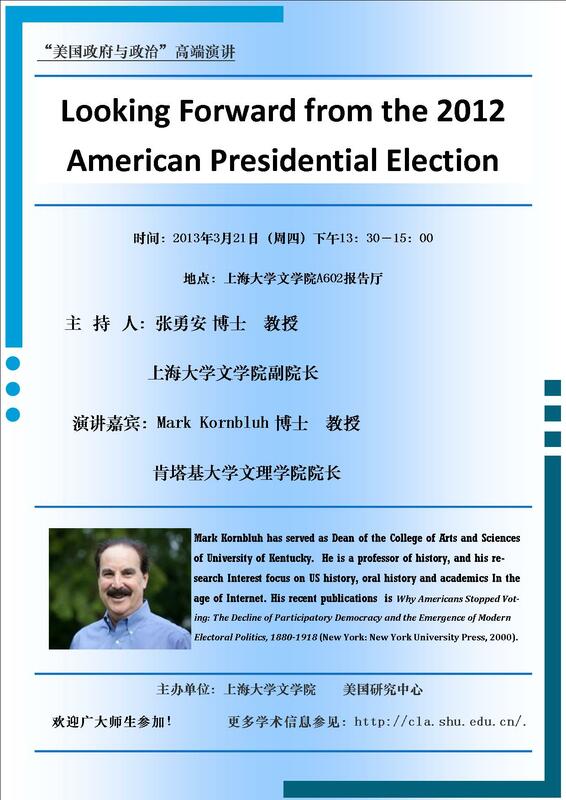 On May 21, 2012, four representatives from the University of Kentucky visited Shanghai University to deliver lectures focused on Appalachian Culture. The Symposium on Globalization, Identity, and Cultural Diversity featured discussions led by Mary Anglin, an associate professor in the Department of Anthropology, Frank X Walker, an associate professor in the Departments of English and African American and Africana Studies, Professor of American Studies and Musicology Ron Pen, and Alumni Endowed Professor of Art, Arturo Sandoval. Dr. Mary Anglin discussed the effects of globalization on gender in reference to Appalachian women and Appalachian communities. In order to better understand the region's past and present, studies of women and gender in Appalachian encourage new kinds of questions and topics for this specific culture, including the manifestations and consequences of power and documenting the impact of trans/national capital on regional settings. Anglin argues that too little attention has be given to this perspective despite its potential value to many fields of study. Download the presentation: Gender and Globalization in Appalachia. Listen to the lecture: Gender and Globalization in Appalachia. Dr. Frank Walker discusses the origin of the word "Affrilachia" and how the use of the word forces a redefinition of a region traditionally described as all-white. Walker noted several key artists and intellectuals from Appalachia to illustrate the region's cultural diversity. Download the presentation: Race and Appalachian Poetry. Listen to the lecture: Race and Appalachian Poetry. Dr. Ron Pen discussed how Appalachian music unities people and place, and how the style came to sprout several new musical genres, such as swing, bluegrass, rockabilly, and contry. Music creates a bond that binds individuals as shared community and creates a society based on values rooted to identiy and place. Dr. Pen referenced the visual imagery and landscape of Appalachia to describe various musical sounds that have been passed down through generations in the region. He combined these two notions to reflect how music creates identity and defines a region surrounded by industrialization and development issues. Download the presentation: Appalachian Music: Sound, Place, and Identity. Listen to the lecture: Appalachian Music: Sound, Place, and Identity. Professor Sandoval discussed the representation of beauty and diversity through Appalachian quilt artists. He used the international art quilt competition Quilt National biannual as his main research reference. Quilt National is described as a trendsetter in the fiber art fild and displays the most important and innovative art quilts from around the world. Sandoval's lecture demonstrated a bias against traditional quilts, which were eliminated from the competition. Download presentation #1: Breaking Boundaries: Composition, Design, and Intent. Listen to the lecture: Breaking Boundaries: Composition, Design, and Intent. On the last day of the three-day event, Professor Sandoval also gave a demonstration of tapestry-weaving on a traditional loom and shared a slideshow featuring highlights from his life's work. Download presentation #2: Remembrance & Transformation. 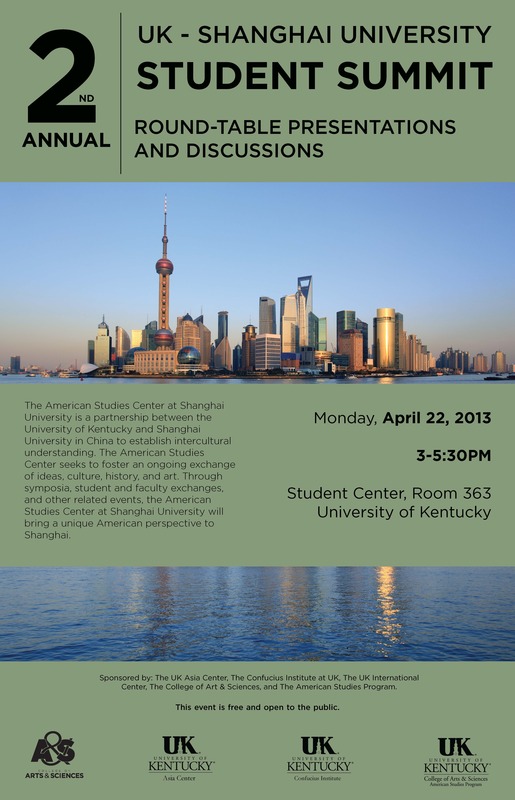 On March 29th, 2012, three representatives from the University of Kentucky visited Shanghai University to deliver lectures on Urbanization in the American South. Below are abstracts of the presentations made by Professors Rich Schein (Department of Geography at UK), Patricia Ehrkamp (Department of Geography at UK), and Doug Boyd (Louie B. Nunn Center for Oral History, University of Kentucky Libraries). Dr. Rich Schein introduced and discussed contemporary transformations of the American urban landscape. Conceptually, the urban landscape is presented as: the built environment, the tangible, visible scene, and the visual and spatial order of the city. The urban landscape is both mold and mirror of urban socio-spatial practice; and can be seen as a window into urban issues more broadly considered. More specifically, Schein presented a broad and accessible introduction to US urban landscapes through contemporary debates and practices in the city, including: public-private partnerships, the use of public space, urban redevelopment and revitalization, issues of tax financing and land acquisitions, planning and zoning practices, gentrification and as well as more general considerations of the race, class, and gender dimension of American cities. Dr. Doug Boyd, Director of the Louie B. Nunn Center for Oral History at the University of Kentucky discussed the use of oral history in historical documentation. Boyd featured content from his recent book Crawfish Bottom: Recovering a Lost Kentucky Community. Crawfish Bottom, a neighborhood in Frankfort, Kentucky, was known by most as the "bad" part of town. Known as a slum, Frankfort city officials advocated the destruction of this neighborhood since the 1870s. It was eventually destroyed as part of the national urban renewal movements in the 1950s and 1960s. Boyd discussed the roles of oral history, public memory, archives and reputation in the formation of the historical narrative. Dr. Patricia Ehrkamp discussed the implications of shifting immigration patterns for the cities of the southern United States. Since 1990, states such as Georgia and North Carolina have more than doubled their immigrant populations, and southern cities such as Atlanta and Charlotte have become important new gateway cities for immigration. Recent immigrants enter local labor and housing markets at different ends of the spectrum, contributing to the suburbanization of immigrant populations and to increasing diversity in these cities’ suburbs. This accelerated growth of immigrant populations from increasingly different national backgrounds, however, has not been without tensions as immigration changes existing ethnic, religious, and race relations. Ehrkamp examined these social and spatial transformations in southern metropolitan areas, paying particular attention to religious and ethnic diversity and changing understandings of citizenship and immigrant incorporation.